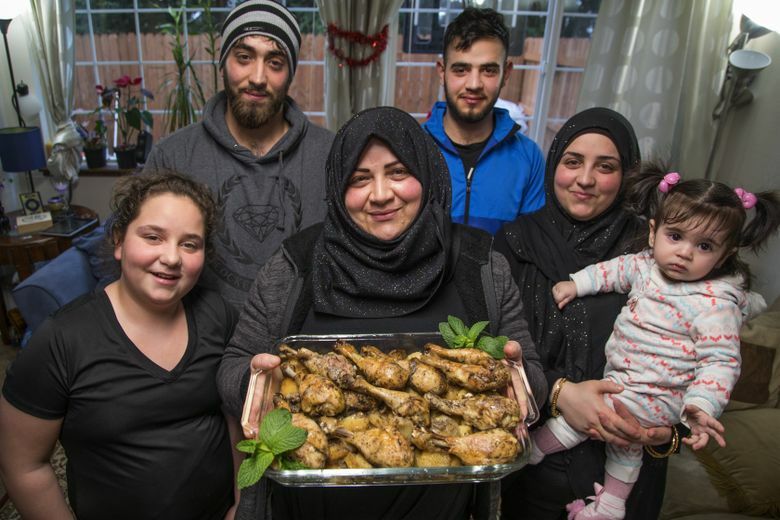 Now living in Tukwila after fleeing civil war, Emtisal Bazara and her family serve familiar hospitality in their new home. HOSPITALITY IS CENTRAL to Syrian culture. When I met Emtisal Bazara and her oldest son, Walid, 22, she didn’t offer refreshments; she provided them. Her coffee was rich and dark, served in small cups. “Syrian coffee,” she said when she put down the tray. I asked her what made it Syrian. “A Syrian makes it,” she said, smiling because she’d made a joke in English. Seven years ago, the Bazara family was living a comfortable life in Aleppo, Syria. Emtisal owned a beauty salon and took care of Walid and his three siblings. She made them breakfast every day, and took her two youngest children, Mohammed and Alaa, to school. Her husband, Ahmed, owned a company that repaired machines and large appliances. When civil war broke out, the Bazaras suddenly found themselves constantly in danger and without electricity and water. They fled to Jordan in hopes of waiting there for the war to end. But years went by, and they realized they might never be able to return to Syria. Life in Jordan was expensive; work was difficult to find; and there was no path to citizenship. Eventually, they moved to Turkey and applied to immigrate to the United States. • The Bazaras also were helped a great deal by volunteers in a Facebook group called Welcome Home Refugees. Two years and six rounds of interviews later, the Bazaras were finally granted visas. On Dec. 14, 2016, Ahmed, Emtisal and their two youngest children arrived in Seattle. Flights were so full that Walid; his older sister, Jidaa (who was 5 months pregnant at the time); and Abdul Malek, Jidaa’s husband of two years, had tickets to follow just days later. On the morning of their planned departure, Walid got a call — Immigration was too busy; they needed to wait a month. A month later, they were told to wait another week. After working with U.S. forces in their home countries, three people are granted Special Immigrant Visas and begin to rebuild their lives in Washington state. (Ramon Dompor and Erika Schultz / The Seattle Times) Read more. When the travel ban was temporarily lifted by judicial order, the family was reunited at SeaTac Airport with tears, cheers, flowers and news cameras. Now, Walid is studying math and plans to study software engineering. Ahmed is working. Mohammed is in high school, and Alaa in middle school. Jidaa and Abdul Malek welcomed a daughter in April. The family lives in an apartment in Tukwila that was completely furnished with donations collected by the community. Everyone is learning English, but for now, Emtisal communicates best by feeding everyone. 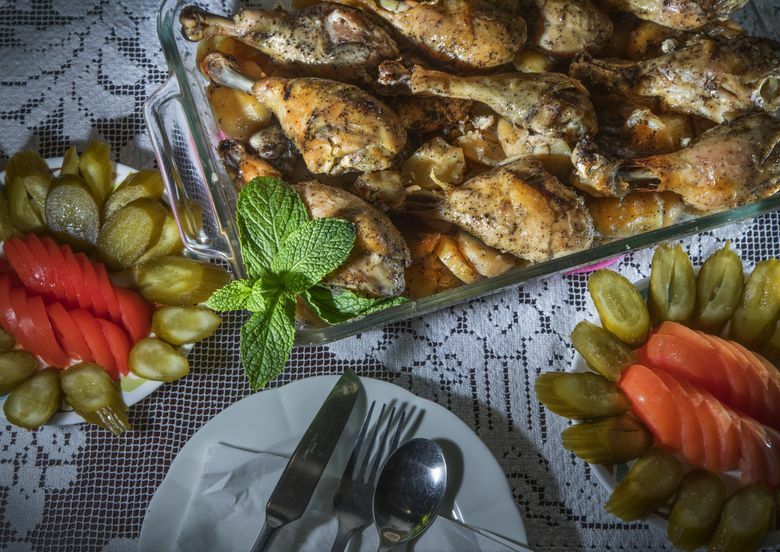 Syrian food is aromatic and complex. There are 14 “governorates” in Syria, a country the size of Oklahoma. Recipes for the same dish can vary greatly by region. Bharat, for example, is a spice mixture that seems to always include black pepper and allspice, but also can contain cinnamon, ginger, nutmeg, cloves, cardamom, coriander, cumin, paprika or Aleppo pepper. Named for the Bazaras’ hometown, Aleppo pepper lends its medium heat and almost-raisin-like sweetness to Faroug Batata, chicken with potatoes. This is Emtisal’s recipe, adapted slightly. 2. Put the vinegar, water and 1 tablespoon of kosher salt in a large resealable bag. Shake to dissolve salt. Add the chicken. Leave to marinate in the refrigerator for 1 hour, turning the bag occasionally. 3. Toss the potatoes and onions with the oil, and season with salt and black pepper. Spread the vegetables in a roasting pan. 4. Remove the chicken from the marinade, and pat dry. Season inside and out with salt. Rub the Aleppo pepper all over the chicken. Place the chicken upside-down (backbone-side-up) on top of the vegetables. Cover the pan with foil, and bake for 50 minutes. Remove the foil; turn the chicken breast-side-up; sprinkle with the remaining teaspoon Aleppo pepper; and continue to bake for about 30 minutes, until the chicken is cooked through and the skin is crisp. Leora Y. Bloom is a Seattle food writer. Steve Ringman is a Seattle Times staff photographer.